Greetchen: "Tremendous! Gloria, what is the common and scientific name of the bird? " Gloria: "Although the population increased and is more stable, it is still considered endangered. The main reasons are the loss of habitat and the predators such as the mongoose, feral cats, domestic cats and mice. They are vulnerable because the female will lay eggs in the soil between the dry leaves." 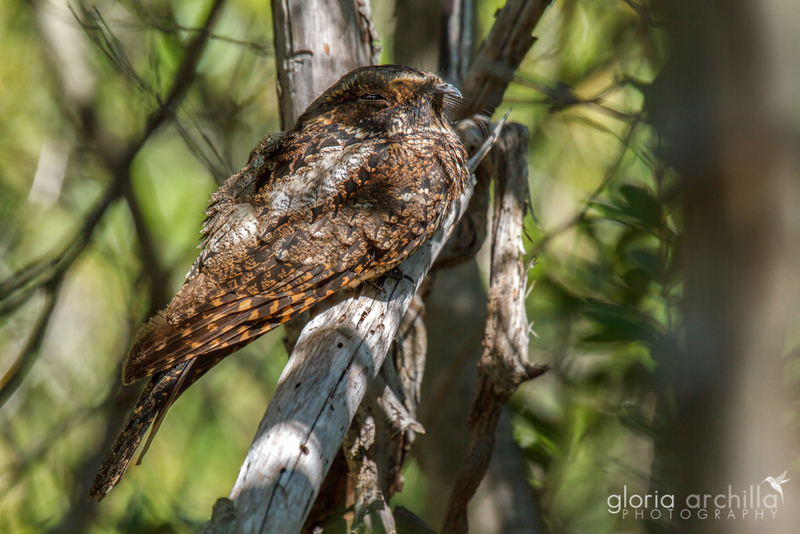 Gloria: "The Nightjar is mainly concentrated in the Guánica State Forest and the Susúa Forest in Sabana Grande. It is easier to hear it at night than to see it during the day. Many times I've been looking without success." José: "Tell us how did you achieve this beautiful photo"
Gloria: "I was walking with friends in the Guánica Forest. I noticed something strange on the branch and stepped back to watch it again. My hands trembled as I was taking the photo, as I knew that I had found the Nightjar! That encounter was a huge thrill. I’ll never forget that day, because this is not common. I have friends who have spent years visiting forests and have never seen the Nightjar. Just, pure adrenaline! " Greetchen: "What motivated you to venture into bird photography? What do you enjoy most?" Gloria: "I was the photographer of the family, but one day I had grandchildren and they were so fast that a friend suggested me to buy a more sophisticated camera. I like all types of photography, but I fell in love with birds. My eyes began to see things that previously I never looked and appreciated such as migratory warblers flying over the sea three days to reach Puerto Rico. I started learning the names of birds and their songs. My love for birds caused me a desire to protect our lands and forests." José: "You have a personal webpage of beautiful birds and all the photos carry a message describing the species and your experiences. What motivated you to create it?"